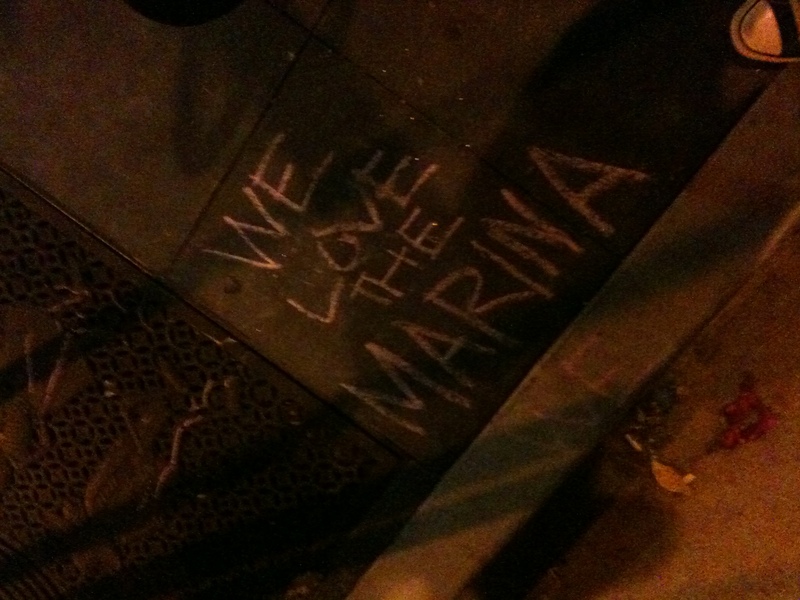 Marina people: we sure love to hate ’em, what with their clean neighborhoods and surfer-influenced fashions. Well here’s a shocker, maybe they don’t like you so much either. But what’s the problem? We like drinking lots of beers too! As for sports? The World Cup was cool! 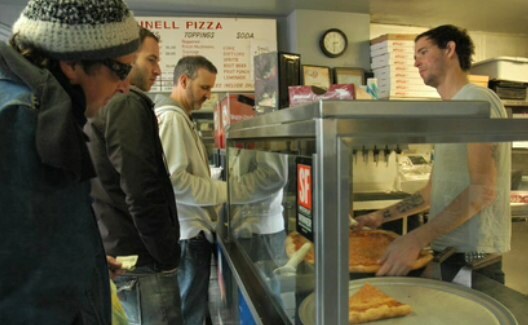 Good, expensive food? Yes, please! Didn’t you also go to a good college? Uh-huh! Thank you, anonymous Mission chalker. The olive branch has been extended. Bros and hipsters… living together… mass hysteria. 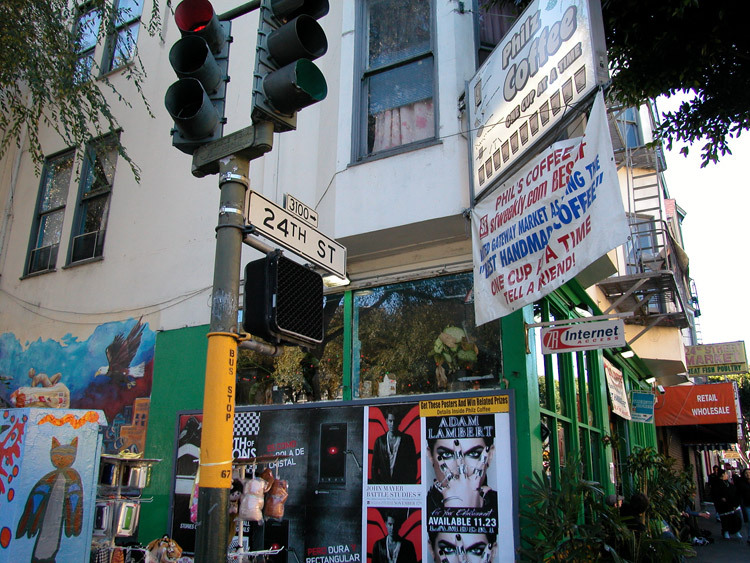 NBC Posts Groundbreaking Article About Valencia St.
Watch out Brooklyn! Valencia is The New Hip Street in the City according to NBC Bay Area! Mention of skinny jeans? Check. Mention of ironic sunglasses? Check. I’m so glad our “flannel-draped” community gets to park our bikes in front “high-end restaurants” like Spork. NBC really hit the nail on the head with this one. Author Vic WongPosted on July 16, 2010 Categories Local Businesses, News, White GuiltTags NBC, Valencia St6 Comments on NBC Posts Groundbreaking Article About Valencia St.
Ok, I see what they’re trying to do here, and the intention is quite honorable. Devoting front page space to a celebration of educational achievement is definitely commendable. However, is it really necessary to force the poor person who hands out these free papers to wear a graduate cap and gown??? I’ll go out on a limb and assume that one of the primary reasons why this person has a crappy job like this is that they did not have the same advantages while growing up as the professionals who dismissively ignore their hand-off at the top of the BART escalator every morning. To rub it in by sticking them in a cap and gown when in all likelihood they never even had the opportunity to graduate, forcing them to endure the irony while being scornfully rebuffed by every young professional who ascends the stairs? SF Examiner, you’re better than that. Local band Monarchs (couldn’t find their website) apparently hired some day laborers to star in their music video filmed on Bernal Hill. I think I’ll just leave it at that. I’m only sorry the intention of this drive was unclear to you. Actually, our drive was a part of a bigger organized effort spear headed by the founder of JADE yoga mat, during the weekend of the annual San Francisco Yoga Journal Conference. 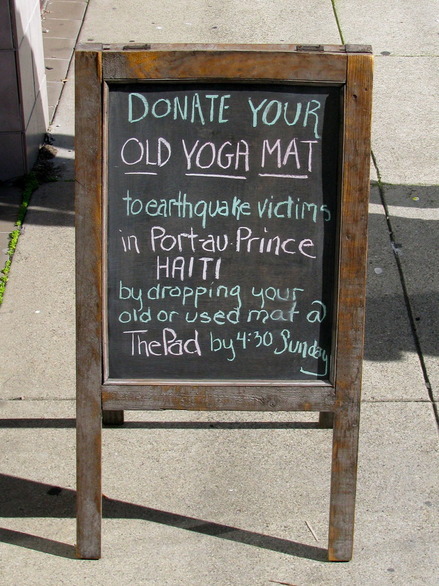 JADE asked studio owners, teachers, students alike to give up their old or used mats so that the thousands of suffering people in Haiti may have somewhere softer the ground to sleep. So yeah, it’s a misunderstanding, but you gotta admit it’s a funny misunderstanding. Like that time my math professor wrote that equation “f=avt” on the board in a way that looked like “f=art”. The class had a giggle, he set the record straight, and got over it. You Know You Want To Spend MLK Day Morning Cleaning Up 24th St! Already donated to Haiti relief and have an itching some more philanthropy? Laurie sent us a note about some neighbors organizing a community clean-up of 24th St on Monday morning. That should bring your smugness to an all-time high! Start 2010 with a benevolent gesture and Join your neighbors in acknowledgement of A Day of Service on Dr Martin Luther King Junior’s day. Bring your garbage bags, a caring attitude and an interest to improve your neighborhood. There will be two 2-hour work periods starting at 10:00 am and 12 noon: choose from either one. It is proposed that folks work in groups of 4 or less. Meet at Phils Coffee on 24th street and Folsom at either 10:00 am or 12 noon to establish/join a group. 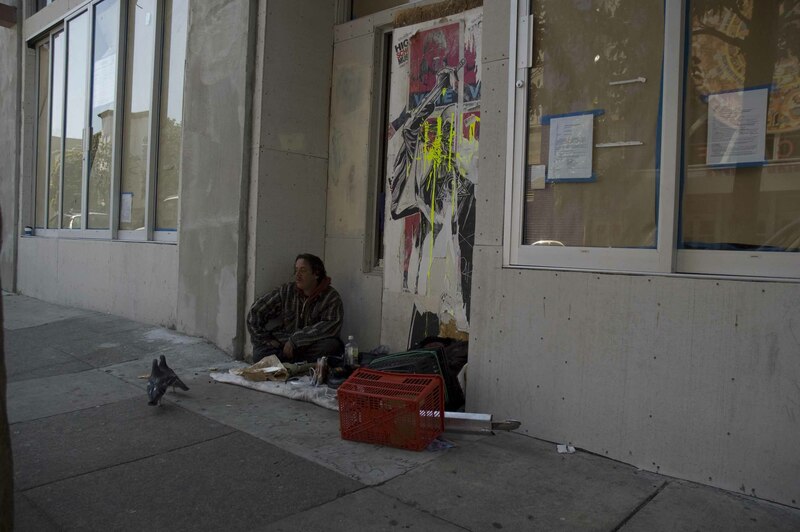 The intention is to collect street garbage within one city block around 24th street. Alternatively there is an interest to do some weeding along Harrison street sidewalk from 22nd to 24th. Looking forward to working with other concerned citizens!!!! Oh, and watch out for sinkholes. Author Vic WongPosted on January 16, 2010 Categories Being Cool, White GuiltTags 24th St, Community Clean-up4 Comments on You Know You Want To Spend MLK Day Morning Cleaning Up 24th St!